APHA Annual Meeting Blog: There’s an app for that: Download the APHA Annual Meeting mobile app today! There’s an app for that: Download the APHA Annual Meeting mobile app today! This blogger loves the APHA Annual Meeting and Exposition program. That giant, freshly printed, phone book-like tome overflowing with hundreds of chances to learn about public health’s latest innovation, insight and invention. Every year, when my copy arrives in preparation to launch this very blog, I gather my trusty yellow highlighter, a stack of sticky fluorescent page markers and a cup of hot tea and immerse myself in the opportunities. What can I say — I’m a total public health nerd. That being said, however, the Annual Meeting program can be a bit cumbersome to haul around a convention center for five days. It truly is the size of a small phone book and after a few days of pulling it in and out of my bag, all of those page markers begin to join the wayward gum wrappers and pen caps in the dark corners of my newest APHA Annual Meeting tote bag. It turns out that sticky page markers are not the most effective scheduling tools. Thankfully, APHA agrees and now, as they say, there’s an app for that. 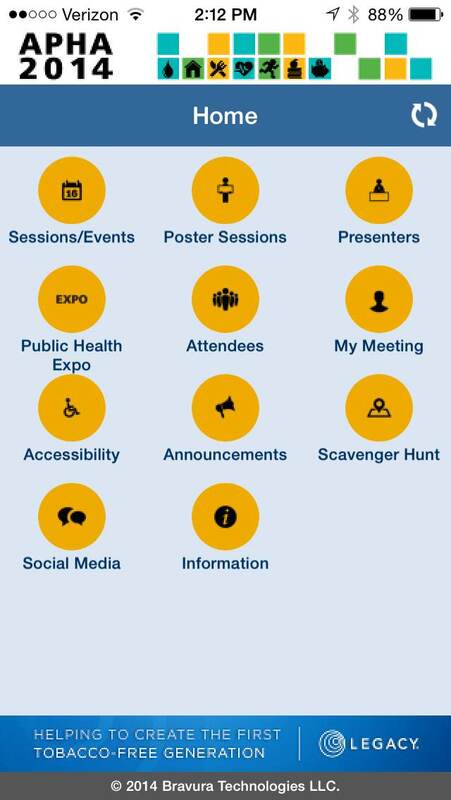 For the third year in a row, meeting attendees can download the APHA Annual Meeting mobile app for easy access to all the information related to the Annual Meeting, including the massive meeting program. Those of you with Apple or Android phones can download the free tool in your app store by searching for “APHA meeting,” while those with other brands of smartphones can download our mobile Web version. The mobile app lets users search scientific sessions, abstracts, author information and session room locations; view the Public Health Expo floor plan and maps; create an event itinerary and sync it with the APHA personal scheduler or your phone’s calendar; receive meeting alerts; and access general meeting information, such as info about shuttle buses, first aid and designated breastfeeding areas. The app also lets users connect with fellow Annual Meeting attendees — you can search through a list of attendee names and send him or her a message directly (though no one’s personal information is provided through the app). Also this year, attendees can use the mobile app to play Passport to Prizes. Just click on “scavenger hunt,” scan quick response (QR) codes at all 20 designated Expo booths and be entered into a drawing for a variety of cool prizes, such as free registration to next year’s Annual Meeting or a free, one-year APHA membership. You’ll need an Internet connection to initially download and launch the mobile app. But after installation, no Internet connection is necessary to access its contents. Also, you’ll want to download the mobile app before you arrive in New Orleans, as the downloading process can take some time. Plus, you’ll need time to create the perfect schedule. For more information and a list of FAQs, visit our Annual Meeting mobile app page. And leave those sticky, fluorescent page markers at home.